Washington DC – This week, Milwaukee County Sheriff David Clarke accepted a senior position with the Department of Homeland Security. Known for his outrageous and inaccurate rhetoric, Sheriff Clarke has previously suggested that a semi-automatic weapon be added to the Great Seal of the United States and that ISIS and Black Lives Matter activists were forming an alliance to destroy America. TOOL OF THE GUN LOBBY: The gun lobby has consistently relied on Clark to support and defend a variety of radical positions, including a weakening of concealed carry weapons in Wisconsin. After the Sandy Hook shootings, when 26 women and children were murdered, Clarke became a gun lobby media lightning rod when he called for citizens to arm themselves at a time when most were calling for commonsense gun legislation and safety.In addition to speaking at a variety of gun lobby events, Clarke’s cozy relationship with the gun lobby includes roles on their legal affairs, law enforcement assistance, and outreach committees in 2016. 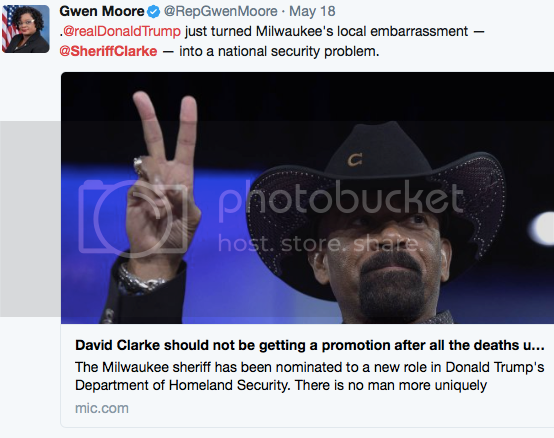 DISREGARD FOR LAW ENFORCEMENT: In 2013, Clarke told his constituents, “911 is not our best option, […] point that barrel center mass and pull the trigger.” Clarke was featured in a ad by the Greater Wisconsin Committee stating, “I don’t dial 911. I will afterwards, to say ‘Come get this dead guy out of my house, he’s bleeding out and he’s messing up my carpet.’” He is known for his opposition to common sense gun safety laws like expanding background checks, and has suggested getting rid of gun-free school zones. CONNECTION TO RUSSIA: Clarke, and many other members of the NRA delegation visited Russia in 2015 to meet with Dmitry Rogozin, the head of Russia’s defense industry and an ally of President Vladimir Putin. Rogozin is one of many in Putin’s inner circle who has been put under sanctions by the US government. This is part of a longstanding relationship between the NRA and Russian officials. The tangled web between Clark, the NRA, and Russia presents a direct danger to American safety and security. CONNECTION TO TORTURE CASE: Charges are being filed against several members of Clarke’s staff in connection with the death of a mentally ill inmate last year, after having the water cut off in his cell. Inmates said Terrill Thomas spent his final days begging for water after jail staff shut down the flow to the pipes as punishment for his behavior. Thomas was one of four people to die at the Milwaukee jail within a six-month period in 2016. State lawmakers and an activist organization called on Clarke to resign over the deaths.